After BIO World Congress in Montreal in June, Sustainability Consult exhibited at The European Forum for Industrial Biotechnology and the Biobased Economy (EFIB) last week on our home turf in Brussels. EFIB is the largest bioeconomy conference in Europe. We took our beautiful, reusable and recyclable cardboard stand to the exhibition hall at The Square, set it up and brought along Belgian chocolates to treat our visitors. As the conference took place in Brussels, we were able to bring the whole Sustainability Consult Team to the exhibition. As well as exhibiting, we also sponsored the cotton conference bags. We were delighted to see people going around the conference and the exhibition hall with the Sustainability Consult EFIB bags. We also provided an insert on credible communications in the biobased economy in the bags. At EFIB, we shared our experience in sustainability communications in the bio-based chemicals and plastics sectors with many different stakeholders and learned a lot from these conversations. We met some of our old friends and made some new ones. We also ran a free Communications Audit, won by Martin Bellof of Autodisplay Biotech. 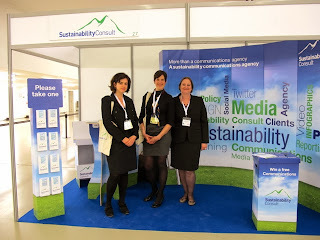 In the coming months, we will be attending a number of conferences including Sustainable Brands London Conference 2013 as a media partner, the K Fair, Ecochem and the 8th European Bioplastics Conference. We hope to see you there.